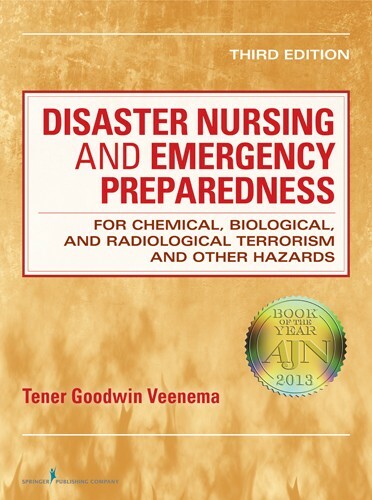 Disaster Nursing and Emergency Preparedness won an AJN Book of the Year award for 2013. For this course, we have selected 12 chapters from the large text and reproduced them (172 pages out of the 764 pages in the entire book). The book is not included. The purpose of the course is to help you develop the skills to efficiently and effectively prepare for or respond to disasters or public health emergencies. Easy to read: covered a lot of information. With all that’s going on this book gives a clear picture of what needs to happen when disasters occur and why and when it needs to happen and resources needed. This textbook was timely given the recent disasters – hurricanes, mass shootings, fires. Excellent! I very much enjoyed this course ... This book was so timely. It is loaded with pertinent information. Appropriately detailed. Well thought out. The need for these plans to be in place, and to be educated ahead of time is so important. It has caused me to want to understand what our city and county have in place. This course was interesting and easy to follow. This was outside my norm. Very pertinent information. Very important for anyone working in public health or in hospitals that have to manage personnel in a disaster. I am a volunteer for the VA Medical Reserve Corps and we must take some FEMA courses prior to volunteering. Those courses seem very dry especially surrounding the roles of different leaders in a disaster. I liked the way this text was written. It flowed well and held interest. Then again I am extremely interested in disaster preparedness. What a timely choice of topic!